There are many ways to teach reading, which can be intimidating. I used to think that I needed to plan multiple centers and activities for every reading period. Nope. 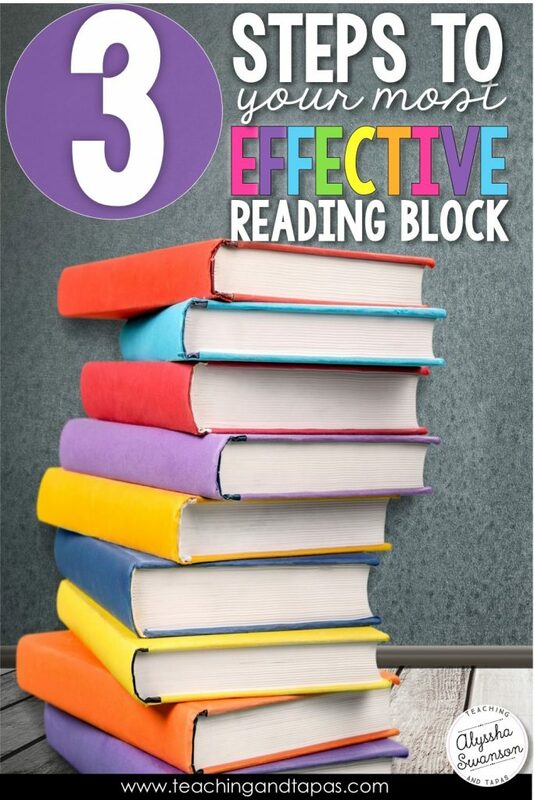 After many years in the classroom and as a reading specialist, I have figured out that this simple three-step plan is the best way to run a successful and effective reading block. The best part is that you can implement these steps at ANY time of the school year! Note: Even if you have a model in place that is different from reading workshop, you should still keep reading this post. 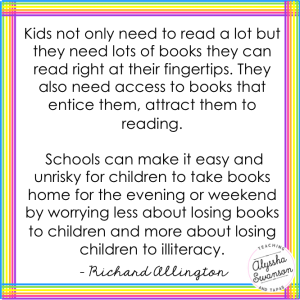 I PROMISE that there are pieces from this that you can use in your reading block! 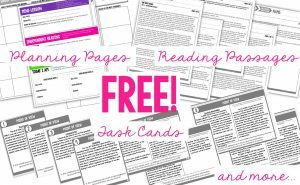 Before we get into all of the details of HOW I lead reading in my classroom, you should download the HUGE pack of freebies I’ve created that go along with this blog post. This pack of sample materials is differentiated for 2nd-5th grade teachers and can be used at any time of the year. Just fill in the boxes below and your FREE DOWNLOAD will be sent to your e-mail right away. Then come on back to read the rest of this post to get started on improving your reading block! You are almost there! You have one more step... Check your email and confirm your subscription to my newsletter and a 60-page reading freebie will download immediately afterwards. THE BIG IDEA – Most reading lessons can be taught in an interactive read aloud with a mentor text. This can be either a published book, a piece of student writing, or a piece of writing by the teacher. Using an interactive read aloud is an incredible way to model how a skilled reader uses strategies to deepen their understanding of the text. Your goal as the teacher will be to model how you use the skill in your own reading during your mini-lesson. The more authentic your modeling is, the more effective. I PROMISE that planning for an interactive read aloud is much less time consuming than planning for reading centers. On average, I spend about 10 minutes planning each lesson. 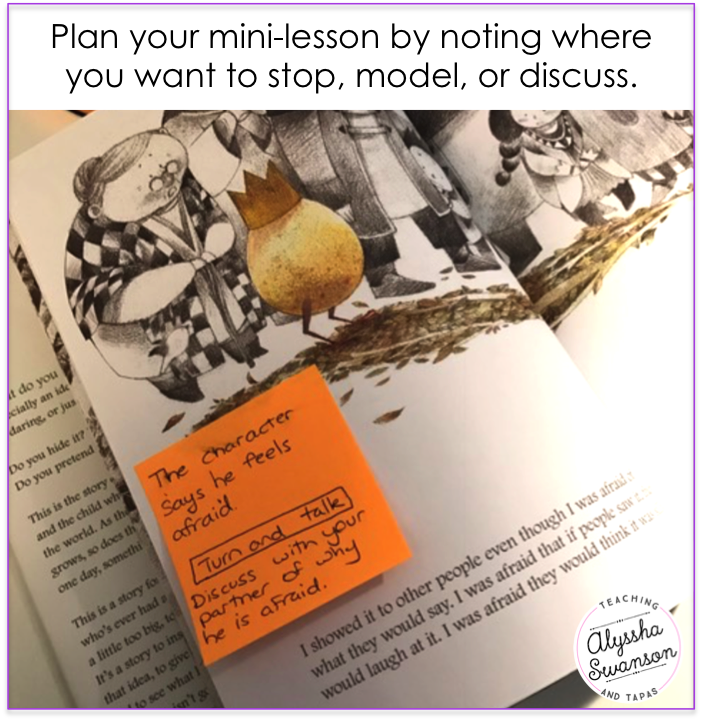 After you have chosen a book that will require your students to practice the skill you want to teach, sit down with a pack of sticky notes and read it. As you read, pay attention to your “inner reader”. When you notice YOURSELF using the skill you want your students to practice, jot it down on your sticky note and put it on that page. It takes a little practice to listen to your inner reader, but once you notice it, your teaching will be so much more authentic! You will also plan “stops “ where your students practice the skill. No kids want to listen to a read aloud when the teacher stops to talk on EVERY page! Don’t worry, an interactive read aloud should only include 3-5 stops per session. Another thing to note is that you do not have to finish reading the book in one session. Turn and Talk: Assign thinking partners that students sit next to during group lessons. My group lessons are almost always on our classroom rug. The students know that when they are on the rug, they are sitting next to their partner. In nearly EVERY one of my lessons, I give the students a chance to share their thinking with their partner. For example, during an interactive read aloud, my words may be – “Is this character likeable, why or why not? Turn and tell your partner what you think”. Sign Language: Instead of asking for volunteers to answer a question, start expecting everyone to think and respond. Sign language is perfect for this! Thumbs up = I agree (or I understand). Thumbs down = I disagree (I don’t understand). Thumbs sideways = I am not sure (or I “kind of” get it). 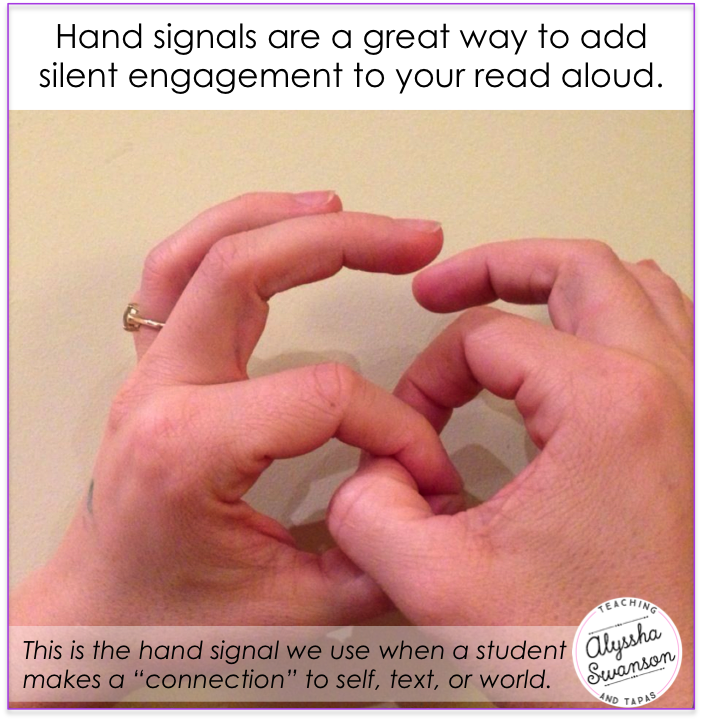 When students make a “connection” let them show you with a symbol rather than blurting. There are so many simple hand signals your students can use to show you their thinking during your read aloud. 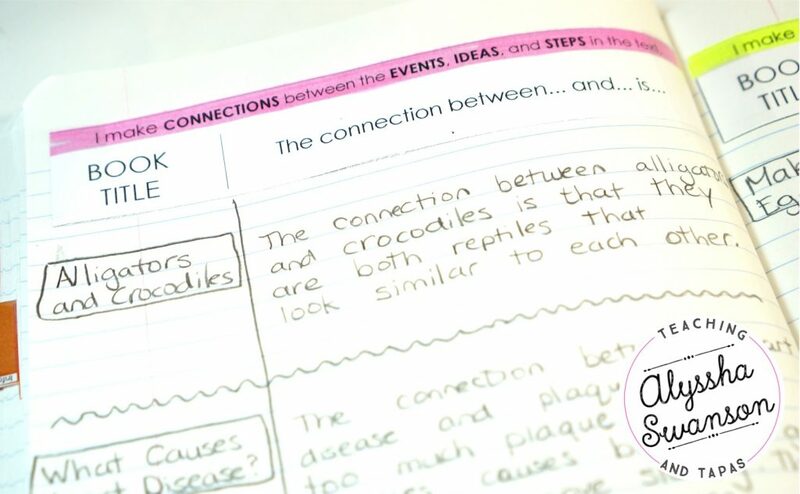 Stop and Jot: Ask your students to bring their reading notebook to the read aloud area. At different points in the text, let them write a response. These responses can be as short or long as you like. Sometimes a one word response requires more rigorous thinking than a full page report! 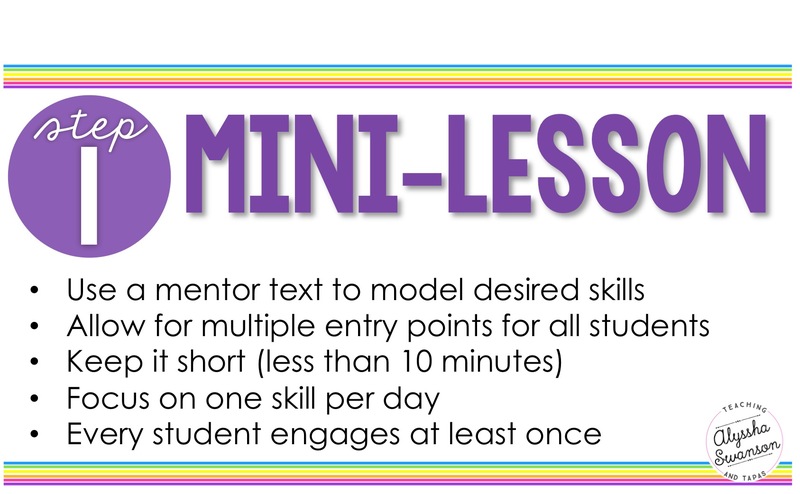 BIG TAKEAWAY – Your goal is to ENGAGE every student at least once during the mini-lesson. Relying on calling on individuals and asking one student at a time a question is NOT the most effective technique. It makes it way too easy for students to zone out. Research shows that interactive engagement activities engage more of the brain than listening activities. Engage them ALL and give them as many opportunities as possible to actively participate in the lesson. Let the student choose the text they read. The student reads at their own independent level. Give students uninterrupted stretches of time to read. After your mini-lesson, the “ideal” activity for most of your students is for them to read independently. I say “ideal” in quotes, because we all know that independent reading is not the best choice for all students. I’ll get to that in a minute. That said, every class has some students who are 1. ready academically, 2. ready behaviorally to choose books to read quietly while you lead reading groups or confer with individual students. I allow my students to choose the books they want to read. They grab their book bins that contain 3-5 books that they can change out within the first five minutes of the independent reading period (or at the beginning of the day). By keeping their books in a reading bin, they do not need to get up and wander toward our classroom library. They are expected to stay in place and keep their focus on reading. About once a week, I peek at their reading bins to make sure that everyone is choosing appropriate books. 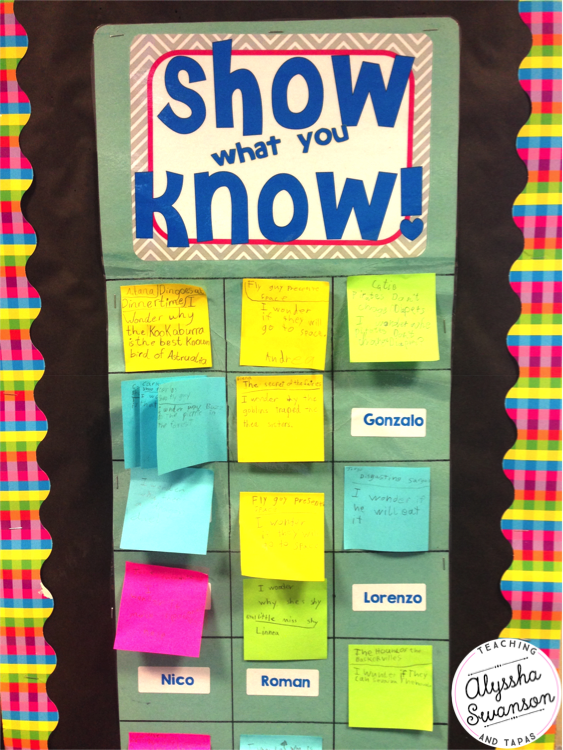 Even though the students have a lot of choice in their reading, I still hold them accountable with our “show what you know” board or in their reading notebook. 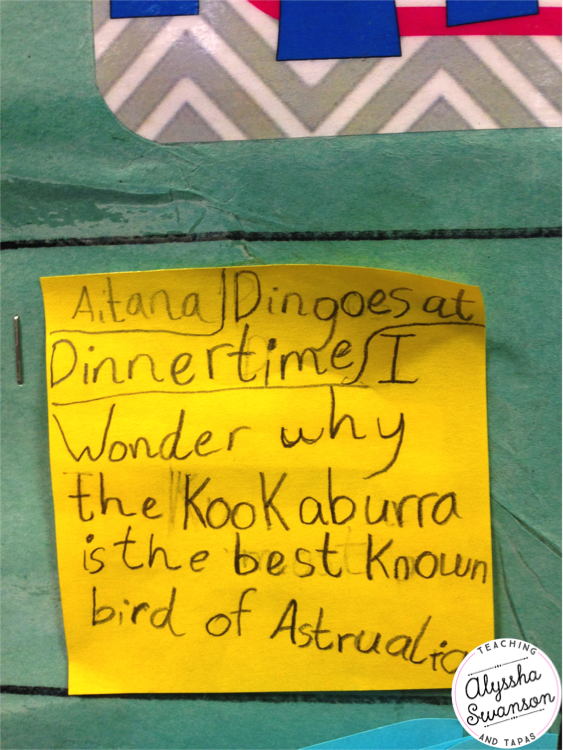 Show What You Know – Each student has a spot for their post-it note so that they are held accountable. We spend about one week on each skill/standard so they have one week to put a post-it up on the board. You can’t see it on the picture, but some students have multiple post-its on their name. This makes it so easy to assess their understanding of the standards! I am very specific about how I want them to write on their post-it note. I need to make sure I get all the info I need from them without it being a scribbly mess on their note so I ask them to write the name of the book and their response to our focus question. 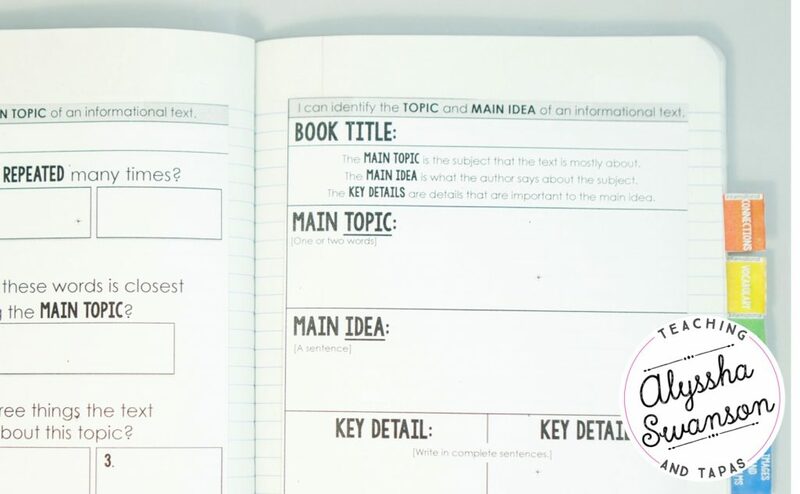 Reading Notebook – Along with our “Show What You Know” board, I use our reading notebooks for keeping students accountable during independent reading. I have compiled a HUGE collection of notebook prompts and graphic organizers in my reading notebook found in my Teachers pay Teachers store. You can find the 2nd/3rd Grade Reading Notebook HERE or the 4th/5th Grade Reading Notebook HERE. If you prefer free, you easily start making your own prompts for students to use in their notebooks. You can download some free samples of my prompts by singing up for my newsletter. The sign-up form is found at the bottom of this post. I use a mix of graphic organizers (like the one below) or just give a prompt (like the one above). My expectation is that students reply in their notebook at least once for each skill we are working on. What about students who need more direction during independent reading? Allow students to read with partners IF it helps them stay focused on reading. Allow online reading programs such as Starfall, Book Adventure, Read Theory, or StoryLine. Set up an individualized stamina goal motivated by positive reinforcement (or consequences if needed). Expect the student to sit next to you if you are leading guided reading groups. BIG TAKEAWAY – Kids learn to read by reading. 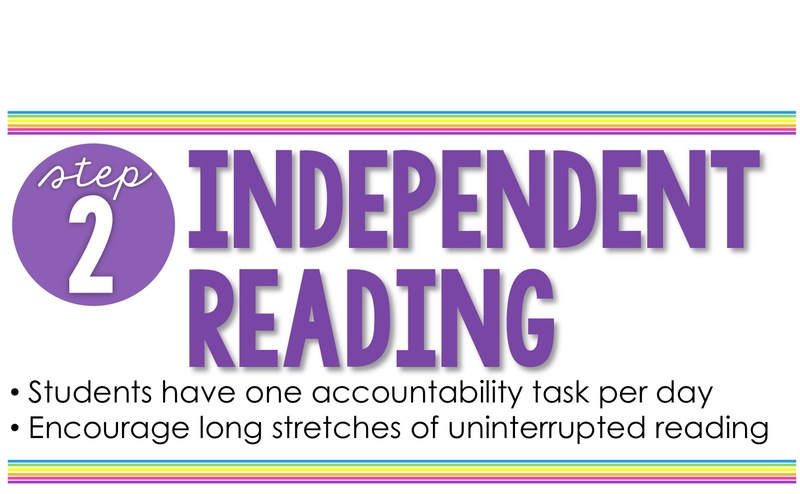 Even your lowest readers need to spend time doing uninterrupted stretches of learning. You still need to keep them accountable when it comes to independently practicing the skills you are teaching in your mini-lessons. While most students are reading/working independently, I am either leading guided reading groups OR conferring. 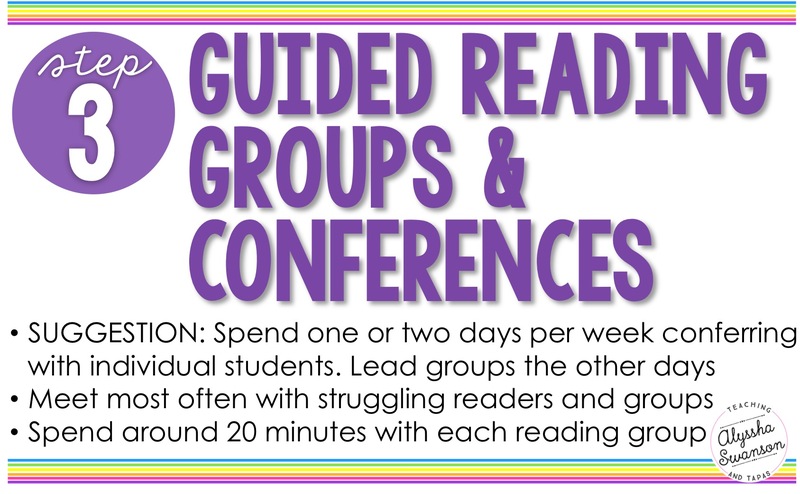 My preference is to spend 1-2 days per week conferring and 3-4 days in guided reading groups. Sometimes I do strategy groups instead of guided reading groups. This means the group is made up of students who are not necessarily on the same reading level, yet need to work on similar skills (i.e. fluency). What is the purpose of guided reading/strategy groups? What is the purpose of conferring? One thing that I have found is that I need to spend more time with my lowest readers. I try to meet with my lowest group at least every other time I do guided reading groups. On a conferring day, I am sure to check in with my lowest readers. I meet with my highest group less frequently. On average, I meet with them once a week. If I have a volunteer or an aid in my classroom, my high group meets with them. Since I have more training in reading instruction than a volunteer, I take the readers who need the most specialized instruction.